Stepping off of the boat from West Bali National Park, we knew that we had a long travel day ahead of us as we traveled to the East coast & our accommodations at Griya Villas & Spa. No matter which way you slice it, Amed is a further drive than your typical Bali destinations. From the airport you can expect a drive of approximately 3 hours & from West Bali National Park we would be around 4 hours & 10 minutes (a small price to pay for some peace & tranquility). Our driver from Griya met us with a smile on the dock at Labuan Lalang Harbor & happily carried our bags to the van. As he pulled the passenger door open I could barely believe the luxury that lay before me! The comfortable, leather bucket seats came equipped with an elevated foot rest & were fully reclining .. that’s right .. like a tiny twin bed that would whisk me away to paradise! Our driver was incredibly kind & accommodating, and he answered all of our questions regarding the journey ahead. Before we know it we had chatted, we had napped, and we had arrived! 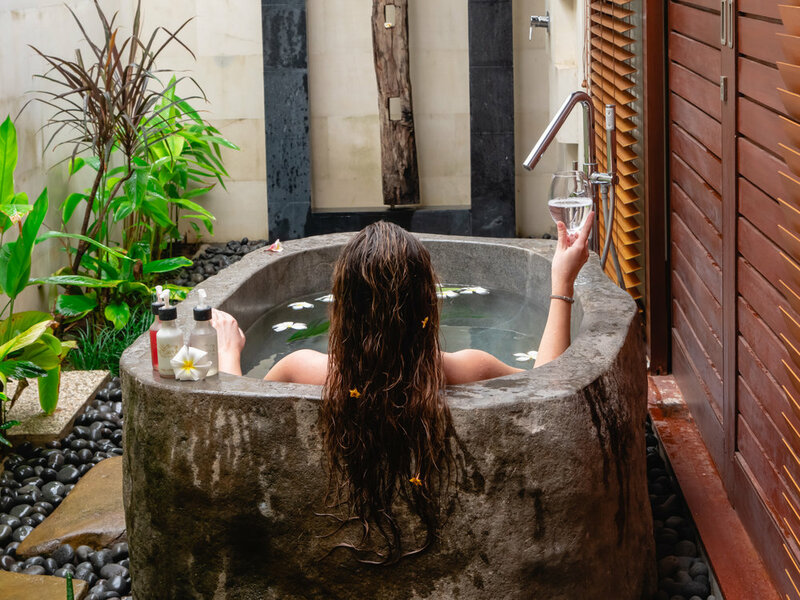 Checking in at Griya Villas & Spa was easy & we were quickly escorted to our private one bedroom pool villa by one of the many smiling faces there. Every villa at Griya has a beautiful view, but it’s the way that they feature the view that had us ready to hunker down & stay forever. Through a series of sliding doors & wall panels, the view of the countryside, beach & ocean is accessible from the pool, common living space, bedroom & even from the bathtub (an added luxury that we were more than thrilled about!) There’s nothing better than a glass of wine (or sparkling water), an ocean view & a floral bath! The dining services at Griya are nothing short of fantastic as well. With meals available in the restaurant, at the rooftop bar & lounge or directly in your villa, we found ourselves eating many small meals throughout the day with expansive views at every turn. Equipped with both private & common area pools, restaurant, cafe, lounge, spa & boutique shopping there was certainly enough to keep us occupied during our stay. For off resort activities, Griya also provided us with information for beaches & snorkeling in the area, as well as driving services for custom day trips. We were lucky enough to experience Bali’s “Silent Day” of Nyepi during our stay, and the staff were incredibly helpful in assisting us with plans for enjoying the surrounding festivities. PROS: Griya Villas & Spa offers beautiful views, delicious food, and a great amount of privacy for travelers who prefer to relax & unwind on their holiday. These villas also cater to travelers visiting with children & pets in a way that is inclusive without being disruptive to other hotel guests. CONS: If white sand beaches are your top priority than this may not be the location for you. Perched in the hills, Griya Villas & Spa offers beautiful ocean views with transportation to beach-side locations, but is not located directly on the beach itself. OUR RECOMMENDATION: The Griya Villas & Spa is truly a unique & relaxing luxury experience that’s well worth the drive from Denpasar. Try pairing a stay at Griya in the East with a stay on the beaches of the South for a perfect combination! 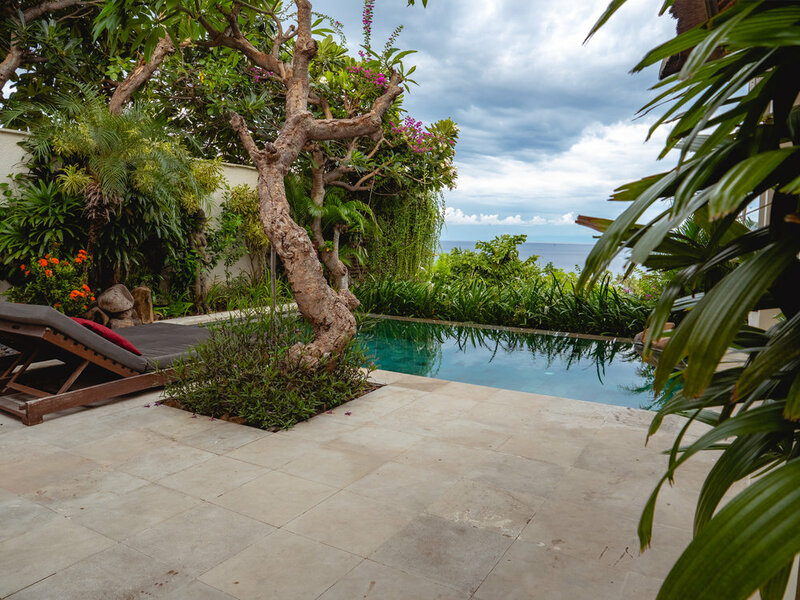 Thank you to all of the staff at Griya Villas & Spa for having the TL Travel team out to explore & review this stunning & secluded location in the East of Bali. It was truly an experience that we won’t soon forget. Book your stay with Griya Villas & Spa today, find more information about the hotel & it’s surroundings on the TL Travel YouTube Channel or contact us directly at reservations@tltravel.ca to find out whether or not this beautiful vacation location is perfect for you! You can find more information on Griya Villas & Spa on the their website at thegriya.com & we hope that you enjoy your stay!